A chubby, round-breasted partridge makes a fantastic, succulent supper dish. Make sure that you get young early season birds as the older birds are much tougher. If the breast of the bird is soft and pliable it is a young bird. Young birds are suitable for roasting, and older birds are only suitable for braising, but I prefer both braised. If it is an older, firmer bird you will need to cook it a little longer. Serve with the braising vegetables, and perhaps some roast parsnips, and red currant jelly. Truss together the legs of each partridge using some string. Heat the oven to 160°C fan/180°C/350°F. In a non-stick sauté pan gently brown the pancetta lardons. Add the pancetta (make sure you keep the fat in the sauté pan), carrots, celery, prunes, garlic, and herbs to a flameproof casserole dish and mix well. Now brown the skin of each partridge in the sauté pan using the reserved pancetta fat. Add a little oil if required. 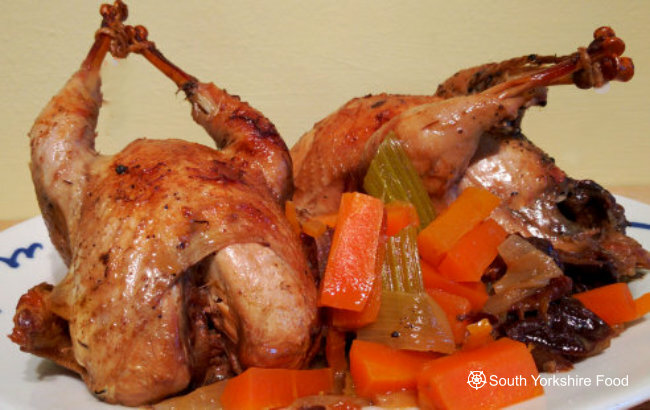 Place each partridge on top of the vegetables in the casserole dish, breast side down, and pour in the stock. Season each bird with salt and pepper. Add the cider to the sauté pan, bring to a boil and reduce by half its volume. Pour the reduced cider into the casserole dish. Heat the casserole dish and bring the stock to a boil. Cover the casserole and cook in the oven for about 15 minutes, for a medium cooked bird, 20 minutes to make sure there is no pinkness. If you think the birds are older, add 10 minutes to these cooking times. Remove the birds and vegetables to a warmed serving plate (remember to cut off the string rom the legs). Whisk the crème fraiche into the stock, and bring back to the boil. Pour the sauce over the birds on the serving dish. Alternatively you can carve off the legs and breast meat, from each bird, and serve on individual plates.